My husband and I had just finished a cold, but very historical tour of Berlin. 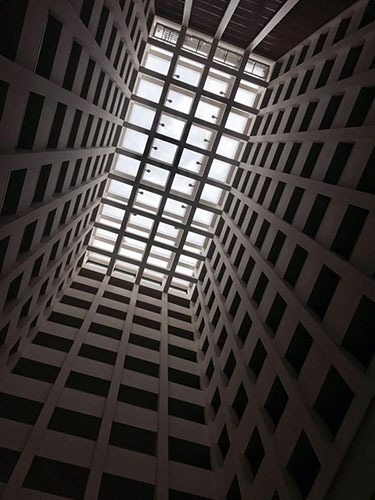 It rained and drizzled throughout our entire visit, and the dreary weather matched the Brutalist architecture of the city perfectly. Aside from a few ornately sculpted Baroque and neoclassical buildings, such as the Berlin Cathedral and the Brandenberg Gate, the city largely reflected an industrial feel. Structures built under the Soviet-rule of Eastern Germany were functional, with their sharp edges and exposed concrete façades, but not necessarily attractive. While a certain beauty can be found in the symmetry, it is the curved, scalloped, and steeply gabled architectural styles that sends visitors grabbing for their cameras and selfie-sticks. 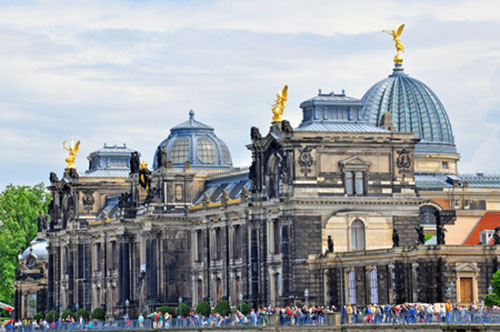 Like the magnificent and fanciful Baroque architecture prominent in Dresden. Had I not known I was in the eastern-most German state of Saxony – I would have easily believed I had just been dropped in Florence, Italy. Although we had driven just two hours from Berlin, the entire architectural landscape had changed – giving Dresden a distinct, polished feel. Almost regal, I found myself thinking. It turns out, that thought was correct. Up until the end of the First World War, Dresden was ruled by a prince elector, one of just a handful of nobles who elected the Holy Roman Emperor. Thus, a prince elector was one of Germany’s most powerful and influential people. In the 18th century, Augustus the Strong rose to power and began filling his city with lavish jewels, architecture and art. As the prince elector of Saxony and king of Poland, Augustus imported artists from all over the world – rivaling France’s Louis XIV (Palace of Versailles, Champs-Élysées) in style and opulence. 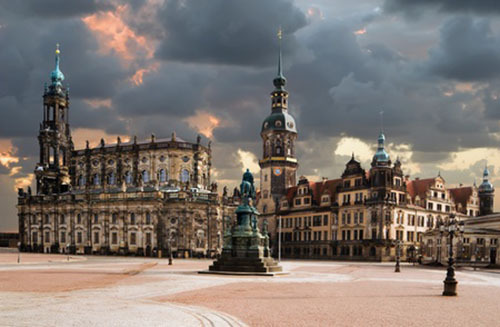 Although Dresden suffered heavy losses during the bombings of World War II, once the Berlin wall (and Soviet rule) fell, new funding from a reunified Germany flowed back into the city, sparking a magnificent restoration – making Dresden a must-do on any Eastern Germany itinerary. Old town Dresden is a delight to wander through, easily filling up an entire day (or two) in sightseeing. Start your tour at the Theaterplatz, the heart of Old Town. There is also a Tourist Info center here, where you can get maps and suggested walking routes of the city. Nymph’s Bath and Zwinger Courtyard. Bordering the southwestern square of the Theaterplatz is the Zwinger Courtyard (housing three art museums), and a delightful fountain and grotto known as the Nymph’s Bath. Dresden Royal Palace (Dresdner Residenzschloss). Containing the famed Green Vault, the palace (also known as the Dresden Castle) was the residence of the electors and kings for almost 400 years. It is a fantastic example of several architectural styles, including Baroque and Neo-renaissance. Church of our Lady (Frauenkirche). When completed originally in 1743, it was Germany’s tallest Protestant church, at 310 feet. But what is most impressive about this stunning stone structure is that is has been painstakingly rebuilt – after being firebombed into rubble during World War II. Brühl's Terrace (Brühlsche Terrasse). It’s no surprise that river cruises dock here, to glimpse a stunning ensemble of architecture known as the Balcony of Europe, rivaling Florence, Italy in beauty. Dotted with cafés, the terrace is a perfect spot to grab a coffee, or glass of wine, and just relax. Old Master’s Gallery (Gemäldegalerie Alte Meister) – which displays over 750 paintings (including Raphael’s Sistine Madonna, several Rembrandts’, Vermeer and much, much more. The Royal Porcelain Collection – a magnificent collection of over 20,000 artifacts, with acquisitions from the Ming and Qing Dynasties. 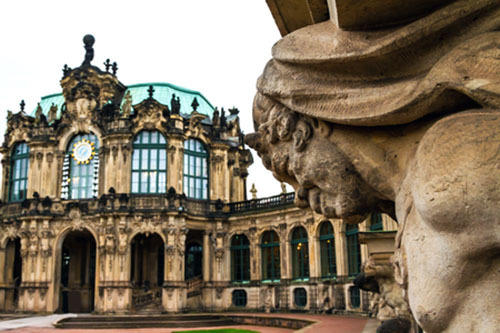 Housed in the opulent, blue-glassed dome of Dresden’s Academy of Fine Arts is a stunning collection of both classical and contemporary painting and sculpture, including Picasso, Guginn and Degas. Even the gallery space is a work of art with soaring entryways and building design. Historic Green Vault (Grünes Gewölbe) – Located in the Dresdner Residenzschloss (Dresden Royal Palace), this unique historic museum contains the largest collection of treasures in Europe. Dating back to 1547, the museum is also older than the British Museum, rivaling only the Vatican as the world’s oldest museum. Nine palatial rooms display approximately 3,000 masterpieces of gilded silver, ivory, amber, opals and pearls, bronze, diamonds and emeralds. TIP: You will need a ticket with a timed entry to access the vault. Additionally, you will have to check any coats, strollers and bags in the designated cloakroom before entering the collection. Save time by reserving your tickets online. Bodega Madrid. Dresden has a surprising wealth of culinary establishments, including several tapas restaurants. Instead of heavy, German cuisine, we thoroughly enjoyed the delicious and lighter variety that Bodega Madrid offered. Reservations are smart for dinner. Two cities, two histories, each with different stories and character told throughout their architecture. Both offer their own unique style – which is best experienced spatially in person, as only architecture can truly tell.